Why DIY when You Can Buy a Camper? Camper living is becoming one of the most popular ways to have freedom and save money on rent and mortgages at the same time. It is simple enough, if you have a nice budget to go and buy one already remodeled and decorated for traveling and living, so why are people choosing to buy old campers and redo them on their own? There are quite a few reasons for this choice and we will explore a few. Buying an old camper give you the option of putting in it all the things you desire and though at the end of the remodel, there may be a significant budget spent, the owners will have exactly what they want and need personally for their living and traveling space. Buying a camper already set-up for living and traveling is definitely the easier way out most of the time but you need money and or loans up front to aquire such a camper. When you choose the DIY method you get the fun of being creative and imaginative about what you want the camper to look like inside and out. Money is spent in smaller amounts at a time, than all at once. DIY methods give you the opportunity to save and make money in between projects. You can rip everything out and begin from scratch, that’s the first step. There are many salvage yards that have the supplies you need for pennies on the dollar and some materials you can actually acquire for free. You may, of course, find a new camper that is to your liking, but the best way to get the vehicle and home of your dreams is to do the work yourself. 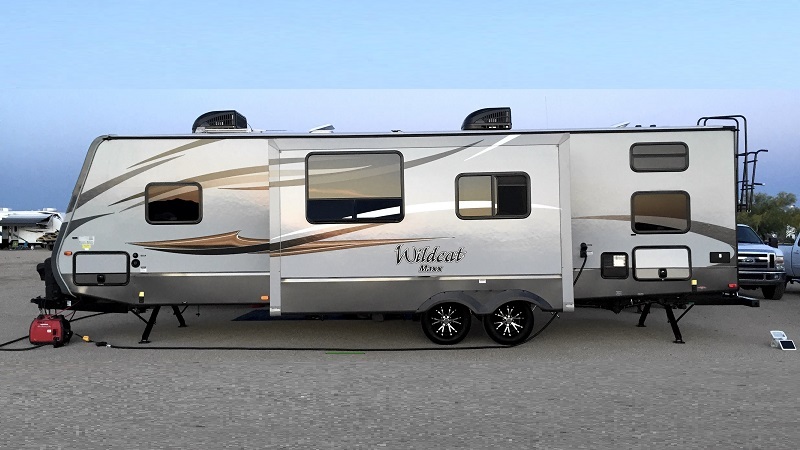 Personally you may prefer or even need items in unusual places, whereas, if you purchased a new or used camper, the kitchen will be where it was originally planned to be. No one is going to spend money on a new or used camper that is already complete to rip it apart and redo it all over again. The budget would need to be pretty large and it really doesn’t make any sense. Buying an old camper that needs stripping gives buyers the chance to create something that they have always wanted or needed. Maybe it is more convenient for a particular person, couple, or family to have their kitchen in the rear of the camper. Choosing the DIY option would be the way to go. Many new campers are built for travel only. Families would only use them in good weather during certain seasons of the year. A live-in camper has certain needs that will keep the owner or owners more comfortable in bad weather and during the cold winter season. For example, in a DIY version you may choose to have a different heating system than one that comes from the factory. You can rig up a heating system that can run at night, while the camper engine is off so that you can be warm and cozy on those winter nights or seasons when you are not on the road. Remember, this is not just a travel vehicle, it is also a home. This is one of the main reasons why it is better for many people to purchase an old camper and remodel it themselves, they know what they need to be comfotable on and off the road. Unless you choose to get loans to remodel your camper, you can buy an old camper without loans to repay and use the money you have saved. Loans are simply another stressful thing to think about. Also, you require former good credit to take out a loan for any purchase and a lot of Millenials are choosing this way of life. They may already have school loans and may not qualify or want other loans for a vehicle purchase. All in all, DIY is a way for your creativity to flourish and with it you can have the camper you choose. The one that is flaoting around in your mind, not necessarily one that is sitting on a camper lot already done and decorated. There are other additions you or your family may need like items for the physically disabled. These additions can be very expensive when buying a camper off the lot, when you can learn to create ramps and other needs for the physically disabled on your own for much less money. Creativity is the key for most people who choose the DIY method.